"Too little philology" — that was the crime of which the old philologist Nietzsche convicted his contemporaries. "Too much philology" — that is the crime of which many readers will likely convict my book. Who will want to bother with minutia of the texts of Francis Bacon when the goal is something as great as understanding the origins of modernity? Worse, who will want to pore over Bacon's Advertisement Touching an Holy War hoping to discover in its little nooks and niches Bacon's reasons for launching a holy war against Christianity? Why deliberately write anything of importance as an aborted fragment, or plan to publish only posthumously? Well, to make sure that the word gets out, escaping Censors; and that it reach those with sensitive ears, safely, allowing the philosophically acute to continue to escape Inquisitors. Innovative and challenging books which spoke too freely could be burnt, and were burnt, along with their writers and readers. But revolving with myself my writings ... methought they went all into the city, and none into the temple; where, because I have found so great consolation, I desire likewise to make some poor oblation. Therefore I have chosen an argument mixt of religious and civil considerations; and likewise mixt between contemplative and active. For who can tell whether there may not be an Exoriere aliquis? Great matters (especially if they be religious) have (many times) small beginnings: and the platform may draw on the building. Bacon was a great statesman: Lord Chancellor of England; a pioneering theorist of science: progenitor of the Scientific Revolution; and a philosopher of liberation. The last of these three great ambitions involved the smallest beginning for a great matter, carefully obscured, as tiny seeds are tucked lovingly into the most protected ground. Biographers of Bacon usually concentrate on his well-documented political career. Historians of science delve into Bacon's writings relating to potential progress and the method of science. But philosophers, and historians of philosophy, except for the most acute, tend to pass him by. 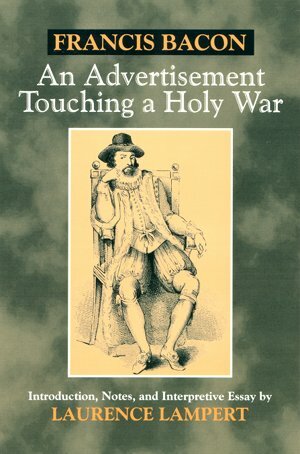 This Lampert edition of An Advertisement Touching a Holy War may be considered an extended documentary appendix to Laurence Lampert's breathtaking philosophical analysis, Nietzsche and Modern Times: A Study of Bacon, Descartes, and Nietzsche. Lampert notes that no editor of Bacon in the Twentieth Century found space or reason to include this little symposium in any collected edition of Bacon's works. It is no small part of the victory of the campaign which began small that Bacon's title itself now may sound embarrassing or offensive to our modern ears. If you already are a Baconian, you will find Lampert's edition fascinating. For those fresh on the ground, I strongly recommend first reading Lampert's Nietzsche and Modern Times which contains extended discussions of Bacon's New Atlantis as well as An Advertisement Touching a Holy War. Lampert's footnotes alone are well worth the price of the book. He explains common words whose meanings have slid in the intervening centuries. More exotically, Lampert illumines odd referents, for instance keying the Latin phrase Exoriere aliquis ("rise up, someone") in the quotation above, to a portentous statement by Dido in Virgil's Aeneid. In addition to footnotes, Lampert provides an Introduction discussing Bacon's characters and setting for the dialogue, as well as a long and meticulous Interpretive Essay. These are excellent. There are two chronologies, one of people and events mentioned in An Advertisement Touching a Holy War (Emperor Constantine; the Poor Men of Lyons, or Waldensians; the Anabaptists; the Battle of Lepanto, etc); and another chronology of Bacon's life. Also a bibliography and a concordance. That's a lot of supporting matter for a small, fragmentary dialogue. What topic, what questions discussed in a little symposium could justify all this? One question, really. Will religion or philosophy rule in the West? Wait; hold your horses! Isn't Francis Bacon himself advocating a Holy War in his symposium? He writes after many years of religious warfare among Christians in Europe, and he prophetically and accurately foresaw yet more religious warfare among Christians in Europe. Is that what Bacon is urging: more factional, righteous killing by intelligent, good, well-meaning people of each other in the name of Eternal Peace? How can this great statesman of progressive England, this great progenitor of the Scientific Revolution, even contemplate such a thing? Yes, the wars of religious idealism are happening in the Sixteenth Century and on into the Seventeenth Century. Protestant Reformation and Catholic Counter-Reformation. The Thirty Years War (1618 - 1648) had begun in Germany when Bacon wrote his An Advertisement Touching a Holy War symposium; he could not have foreseen precisely the catastrophe at Magdeburg in 1631, but surely he sensed its like coming, righteous tragedy and death, Deluge upon Deluge. Indeed, the wars go on and on. With competing sects inspired by incompatible and ineffable revelations, there is no common ground. What should someone of Bacon's position, insight, charity, and genius do about it? What possibly can anyone do? Almost two hundred years after Bacon, Blake from his Christian perspective held decided anti-Baconian ideas — although we must remember that Blake's own brand of visionary Christianity is most unusual if not a revelation unique to himself. The Classics, it is the Classics! & not Goths nor Monks, that Desolate Europe with Wars. Sacred Truth has pronounced that Greece & Rome as Babylon & Egypt: so far from being parents of Arts & Sciences as they pretend: were destroyers of all Art. Homer Virgil & Ovid confirm this opinion & make us reverence The Word of God, the only light of antiquity that remains unperverted by War. When you advance on a town to attack it, make an offer of peace. If the offer is accepted and the town opens its gates to you, then all the people who live there are to be put to forced labour and work for you. If the town does not make peace with you but gives battle, you are to lay siege to it and, when the Lord your God delivers it into your hands, put every male in it to the sword; but you may take the women, the dependants, and the livestock for yourselves, and plunder everything else in the town. You may enjoy the use of the spoil from your enemies which the Lord your God gives you. That is how you are to deal with towns at a great distance, as opposed to those which belong to nations near at hand. In the towns of these nations whose land the Lord your God is giving you as your holding, you must not leave a soul alive. As the Lord your God commanded you, you must destroy them under solemn ban — Hittites, Amorites, Canaanites, Perizzites, Hivites, Jebusites — so that they may not teach you to imitate the abominable practices they have carried on for their gods, and so cause you to sin against the Lord your God. There is the plan and excuse for the siege of Magdeburg. And to the religious, as the author of Deuteronomy says, what are labelled abominable practices depend on one's own nation's revelation, then as now. William Blake privately annotated his 1798 copy of Bacon's Essays with about 120 short comments. If Bacon actually is an atheist — as is seen by perceptive readers, despite all his protective trappings — just what is it that Bacon is advocating? but superstition dismounts all these, and erecteth an absolute monarchy in the minds of men. Therefore atheism did never perturb states, for it makes men wary of themselves, as looking no further, and we see the times inclined to atheism (as the time of Augustus Caesar) were civil times. In the Baconian essay, by wary of themselves, I take Bacon to mean considerate of their own character and actions in the existent world; and by looking no further, to mean sensible of their Earthly and social present rather than anticipating some future Heaven. Thus sensible and philosophical people are peaceful and civil men in their society, rather than superstitious men inclined to righteous and often deadly warfare for their specific vision of Heaven. Philosophically, as a lover of wisdom rather than of revelation of any stripe, Bacon is grounded in reality — a position under violent attack since the earliest days, and still besieged. William Blake is inspired by his own vision, fighting his Mental Fight for the spiritual Jerusalem. But he sees the wide battleground: his distinctive genius also perceptively recognizes Francis Bacon as — in Ayn Rand's phrase — the man who belonged on Earth. In times of censorship and oppression — so, taking most subtle care — Bacon saw the awful need but the great potential future of the real world, and made a small beginning in a great matter. My lords, I have journeyed this morning, and it is now the heat of the day; therefore your lordships' discourses had need content my ears very well, to make them intreat mine eyes to keep open. But yet if you will give me leave to awake you, when I think your discourses do but sleep, I will keep watch the best I can.